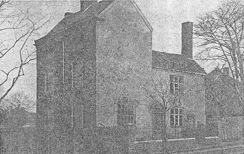 The Spout House, Smethwick, was probably built in the early 1700’s and was demolished in 1937. It was situated on the corner where Londonderry Road meets Taylor’s Lane. It was the home of John Cheshire in the 1841 census and used as a farmhouse, malthouse and brewery. The ownership of the house is chronicled by the Smethwick Local History Society from which the photo is taken. John Cheshire was recorded as living there as early as 1828. He may have moved there from the Bulls Head in Oldbury, a business that his father had set up in 1793. Although he did not at first own the property, (it belonged to a John Gwillam Welch in 1828) by the tithe apportionment maps of 1840 John Cheshire is recorded as the outright owner. The Smethwick Local History Society records some of the run-ins that John Cheshire had with Squire Hanson of Smethwick Hall just up the road. John Cheshire died in 1844 and it looks as if the property was no longer in family possession after 1848.